When life hands you lemons you can react a couple of different ways. Leave your head on the pillow or get up and put one foot in front of the other. After leaving my head on the pillow for a few days, I got up, put one foot in front of the other until I was in the kitchen doing what makes me feel better, cooking. Unfortunately for Tony and I, the past few weeks have dealt us some blows, but we are surrounded by amazing family and friends. Thank-you to those that read this and have been by our side. I have made Borshch with my mom many times (assuming ‘made’ means drinking wine and watching). Last year and at the start of this blog, I chronicled our Ukrainian Christmas Eve dinner, which includes Borshch. My mom measured out the recipes as she cooked from memory. This way I could write them down and make it all on my own one day. I’m workin’ on it. Well I grew great beets this year, although small, and they’ve been in the fridge since October. I paired them up with some organic beets from Planet Organic to make a big pot of Borshch. I followed the recipe, consulted mom and found solace in a quiet kitchen and the comforting smell of soup simmering on the stove like the generations before me. Here is our family Borshch recipe, I hope it brings you as much comfort as it did me last night. Clean off the beats, no need to peel, cut the roots and tough parts off. Grate the beets using a food processor, rough chop them first, the grating attachment makes this very easy and less messy. If you don’t have a food processor, grate whatever way works for you. Makes about 12 cups. In a soup pot, place the beets, diced beet stems, mushrooms, bay leaves, pepper corns and bouillon cubes and cover with water. Bring to boil, cover, simmer covered for 15 min. Add celery, parsley, simmer covered for 15 min. Add beans, carrots, simmer covered for 15 min. Add peas, chopped beet greens, sautéed onions and 1/4 to 1/2 c of water if you think it needs it. Simmer covered for 15 min, the veggies will be al-dante. Once the soup is done, in small sauce pot, cook the flour over medium-high heat, stirring continuously for 60-90 seconds. Take the flour off the heat and add the butter and oil, continue stirring, the butter should melt and maybe froth up a bit. You’ve just made a roux and probably didn’t ruin it over the heat, good job. 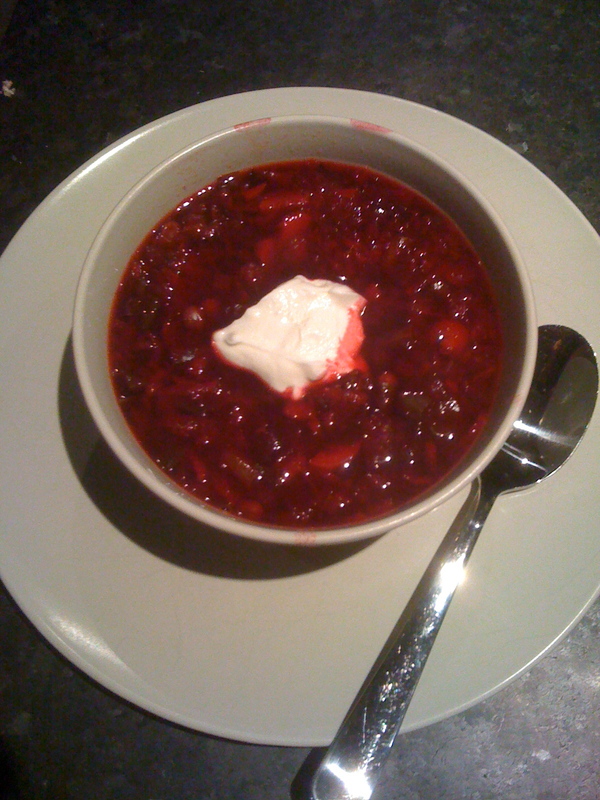 Add three cups of the borsch to the roux, one cup at a time, mixing well, and then add it all back into the main soup pot. The cooked flour and roux brings the flavours together and makes the soup glisten. Look at it, isn’t it pretty. Serve with a dollop of sour creme or plain yogurt and fresh cracked pepper. It’s like a hug in a bowl.